Jim Peters has articles about his days as an operator elsewhere in the Memory Pages on this site, but this is more about the job itself than the individual. Before modernizing of the method of freight contracting and CTC in the operation of freight trains, almost every town had an operator agent. On the Michigan Division of the Big 4 there were 30 agent operator stations from Benton Harbor, Michigan to Louisville, Kentucky. By 1960 they had been reduced to about 5 or 6. These agent operators had to be qualified in the duties of a freight agent, as well as an operator and the book of rules. The larger towns had separate agents and clerks to handle the large volume of freight business. The operators ran trains. We will concern ourselves with the smaller agencies, the one man operation. 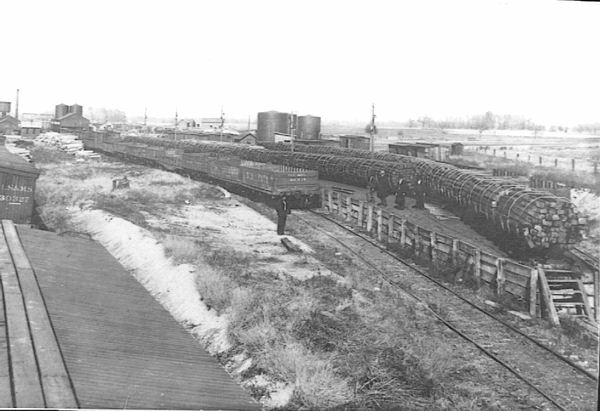 The depots on the Michigan Division varied in size according to the local freight received and sent from the area. The agent operator had to make bills for routing and figure freight rates from the rate books, and type this on each bill. Empties also had a billing. You can see that as the number of cars shipped and the LCL (less than carload), business increased, an agent could be kept busy. Most depots had a waiting room for passengers on one end and the freight house on the other end with the operator's room in the middle. If the town was large enough, there might be a separate freight house near the depot that was also part of the agent operator's job. In the operator's part of the depot was a safe, record cabinets with all of the rate books, and a closet for supplies, etc. The lighting consisted of one or two lights hanging down from a 10 ft. ceiling. Inside the depot, the paint, after 1930 was dark brown below 3 ft. on the wall and a cream above. The outside was painted, after 1930, New York Central light gray green trimmed in dark green. Sometimes these colors were reversed in later years. Before 1930 the outside was Big Four yellow trimmed in white. I don't have a color for the inside. At night the light at the operator's desk was all the light in the office, interlocking towers were the same. There were one or two lights on the passenger platform and the same on the street side. Most of the office space where the orders, phones and the general operation of the trains takes place, is much the same in any depot. 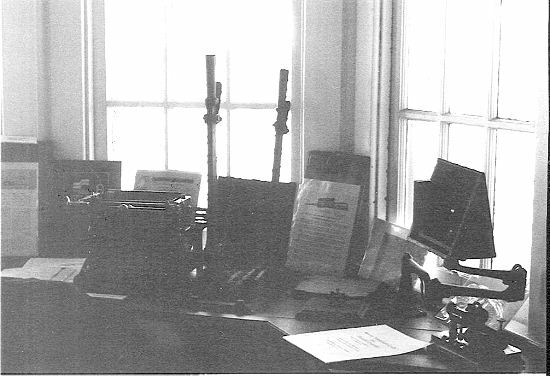 When sitting in the operator's chair , facing the desk was the telephone, a small box divided into several sections to hold train orders ready to be used and the telegraph sounder, that little instrument that makes that click, click when a message was sent over the telegraph line. The telegraph key was the make and break instrument the operator used that the sounder duplicated in sound. Some operators had their own keys and they worked by side motion on the handle, and the operators were fast on these speed keys. As the telephone came, the telegraph fell by the wayside and was little used except by the old-timers. On the use of the telephone, the station phone only transmitted when a pedal under the desk was pushed down to transmit. If a trainman had to use the phone after the station was closed a window on the bay window was opened and the phone used from the outside. A rod from the pedal on the floor came through the desk top so that the trainman could push the pedal down to talk from the outside. For you that have a 1967 or before ETT, if you will look in the back at station calls you will see two letters are used for this. This comes from the days of the telegraph. Each office had it's own two letter call sign which was faster than spelling out the town name, although they did spell the town's name in a train order. In the Manual Block System it is a simple thing to call on the telephone to the next block station and ask for a block for a train but in the days of the telegraph it was different. They had a communicating code. This was rule 316 in the New York Central book of rules issued in 1937. The 1956 rule book did not have this code. The following is the code and if you used the phone you used the meaning not the code. I have heard the old timers say 2 for 76, which means, clear block for #76. 1 - Display Stop Indication. 17 - Display Stop Indication. Train following. 3 - Block wanted for train other than passenger. 36 - Block wanted for passenger train. 4 - Train other than passenger has entered block. 46 - Passenger train has entered block. 5 - Block is not clear of train other than passenger. 56 - Block is not clear of passenger train. 9 - Closing block station, followed by 2. If the block is clear, to be answered by 13, followed by 2. If the block is not clear, to be answered by 5 or 56. When two or more tracks are used in the same direction, the signalmen in using the communicating code must also specify the track. When the station was closed the phone and telegraph lines were lined through the office. That's how it was done before CTC and radio. Times have changed. It's hard to believe a small town like Shirley Indiana with a population of 1500, produced 1000 cars of freight a month and now the nearest railroad is 25 miles away.